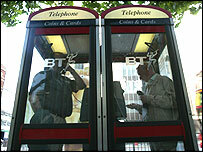 Public telephone boxes could be used to download music under radical new plans being considered by BT. It is currently in talks with a leading provider of digital music content about a deal which could transform many of its phoneboxes into virtual jukeboxes. 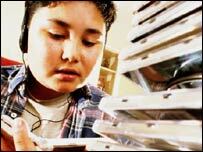 Customers may be able to access music at more than a thousand BT phoneboxes as early as next year. 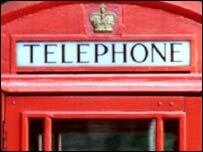 The telecoms firm is exploring ways to modernise its network of 70,000 phoneboxes, 60% of which lose money. Under the plans, anyone owning an iPod or portable music player would be able to go into a phonebox and download a song while out shopping or on a lunch break. They would be able to pay using a credit card or a BT charge card. BT hopes to introduce the new service next year, initially through its network of 1,200 information 'kiosks' which already offer internet access. The kiosks are concentrated in city centre areas, with about 400 situated in London. Providing access to music is seen as an opportunity to attract mobile phone users, who long ago deserted old-style phoneboxes, into BT facilities. It could also provide a potentially lucrative new source of revenue at a time when BT is having to service a huge but unprofitable network of traditional phoneboxes. The majority of BT's 70,000 phoneboxes do not cover their costs. BT hopes to disconnect up to 8,000 phoneboxes over the next year. Under a longstanding agreement, however, the firm is required to pay for the upkeep and maintenance of the country's payphones. BT is currently lobbying telecoms regulator Ofcom to have the agreement relaxed. "The payphone business needs to diversify and offer new services if it is going to survive," Les King, a BT spokesman, told BBC News Online. BT has been trying to make its phoneboxes more user-friendly and relevant. As well as providing internet access, its modern kiosks offer musical ringtones and discounts on accomodation while some are linked to cashpoints. BT hopes that the new service will particularly appeal to tourists and younger users. "It is not a total departure from what we have been doing but it would be new to be able to download to an MP3 player or an iPod," said Mr King. BT stopped building new phoneboxes in 2001. What now for British Telecom?